Get ready for a new generation of feminists, because there’s a badass new set of books that teaches young girls they can be anything they want to be. Yep, the future of children’s literature is finally here, and we are so here for it: Scholastic is releasing a series about amazing historical princesses and blacking out the parts where they get married at age 12. Now this is what empowerment looks like! According to Scholastic, each book in this awesome series will follow a badass princess throughout her journey and feature chapters from her childhood, her reign, and a totally blacked-out section that explains the part of her life where she was a child bride. The series, called Royal Role Models, has more than 600 pages of empowering stories that girls can read, as well as 100 pages of redacted material that describe how women were married off at the same young age as the book’s readers! The first book, due out in the coming weeks, will profile Eleanor of Aquitaine and will feature several chapters about her early childhood learning to speak Latin and play the harp, followed by one with just a single sentences that reads, “Eleanor turned 14.” After that, the book will reportedly start back up in the next chapter when she’s 15 years old and becoming a talented painter in Louis VII’s castle! Wow. 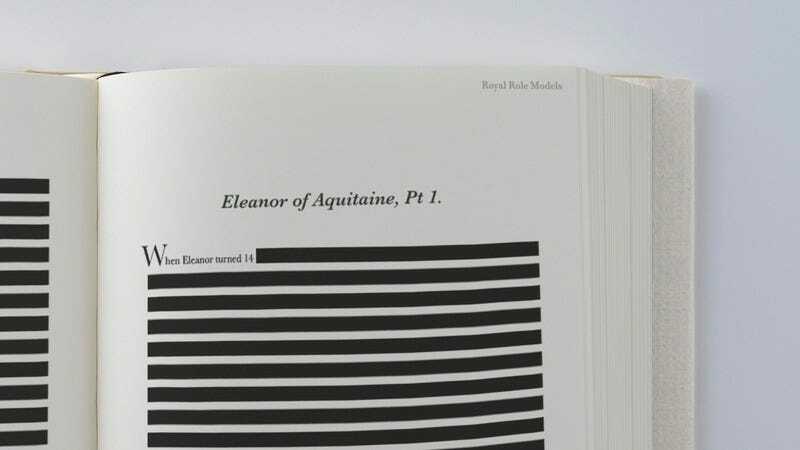 These books are doing some seriously inspirational work, redacted sections and all! Kudos to Scholastic for providing role models as amazing as these women and blacking out the parts where they married men 30 years their senior as part of a political truce and then immediately became pregnant. This series is going to empower girls all across the country, and we can’t wait to see what all of those young feminists grow up to do!